What It’s About: Libby Mannering (Andi Garrett) and Kit Austen (Sara Lane) are happy, normal, well-adjusted teenagers. When Libby’s parents (Leif Ericskon and Patricia Breslin) go out to their friends’ house for the evening, Libby invites Kit over, and, with a bit of withholding of details from Kit’s father (John Archer), Kit gets permission. Libby’s younger sister Tess’s (Sharyl Locke) baby sitter can’t show up so the Mannerings leave Tess in Libby and Kit’s care. Libby immediately shows her maturity and grasp of her responsibilities by starting up a two-hour long prank call session with Kit and Tess. Meanwhile, across town, Steve Marak (John Ireland) kills his wife after an argument, right after the girls prank call him but only get his wife. 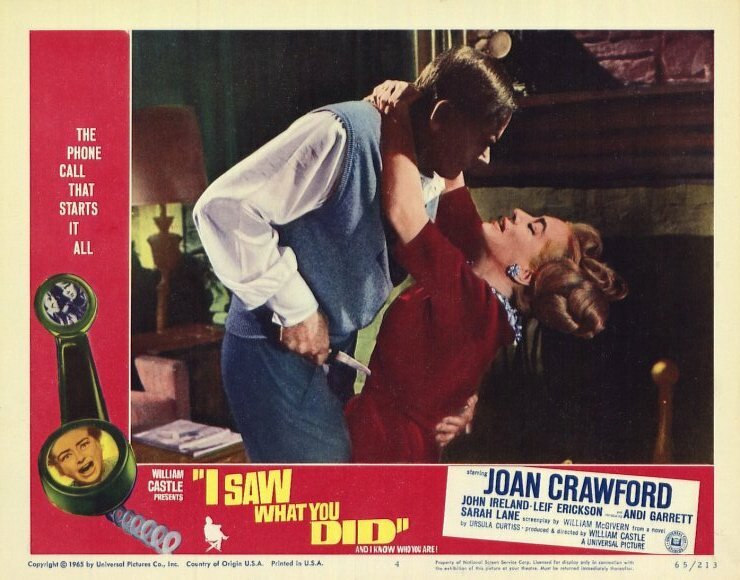 While Steve attempts to clean up the crime scene, he must deal with his meddling, overbearing lover and next door neighbor Amy Nelson (Joan Crawford), passers-by when he is burying the body, and finally a phone call from the prank-call-crazed teens, during which Libby tells him “I saw what you did and I know who you are” and she becomes infatuated with Steve’s voice. When the foolish girls drive by the house to get a look at Steve, things take a turn for the worse. Will the girls realize their mistake before Steve finds and silences them for what he thinks they know? Why Watch it Today? : William Castle, the king of movie ballyhoo, died on this date in 1977. While I Saw What You Did didn’t carry one of his most famous gimmicks (buzzers in the seats at The Tingler or Emergo, the glow in the dark ghost that came out of a box over the screen during The House on Haunted Hill hold that honor), seat belts to keep you in your seat and a screen test on site aren’t half bad examples of his craft. I Saw What You Did is a decent funhouse ride of a thriller, with some deliciously campy dialogue and performances in a film that in some ways prefigures John Carpenter’s Halloween. Read more at our full review. Other Choices: We’ve previously featured Castle’s Bug and Strait-Jacket as well as Joe Dante’s loving tribute to William Castle and his era, Matinee. This entry was posted in Adaptation, Based on a Book, Black and White, Independent, Movie of the Day, The Original, Thriller and tagged baby sitters, children of famous people, crank call, Drive-In, Joan Crawford, John Ireland, Leif Erickson, low-budget, rip-off, teens, telephone, Universal Pictures, William Castle, William Castle Productions. Yeah, it takes a while and is pretty silly, but I had a good time with it. They did remake this as a TV movie in the late 80s with Shawnee Smith and David and Robert Carradine. Hmm. I may need to see that! Oh, wait… I vaguely remember that! I saw it before I saw the original, but I don’t remember much because it was SO long ago. I don’t know if it was better or just more modern. I guess you’ll find out first. Is it on disc or tape or somewhere online these days? No idea, just dimly remembered that it existed and looked it up on the IMDb. It takes years for my gears to turn enough for me to get to things, though, so I wouldn’t expect I will get to it first!